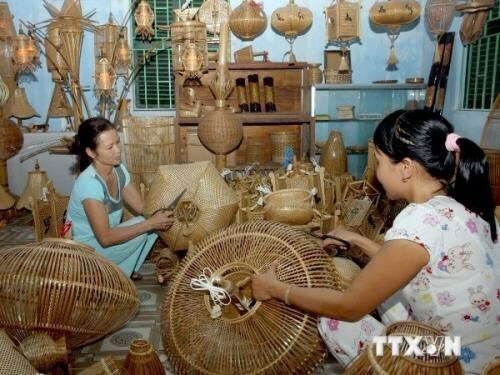 Long An (VNA) – Fifteen southern and central provinces and cities have registered to showcased products at 291 booths at the Mekong Delta Industry-Trade Fair 2017 which is slated for October 11-17 in Tan An city in the Mekong Delta province of Long An. The event, jointly held by the Agency for Regional Industry Development under the Ministry of Industry and Trade, and the provincial Department of Industry and Trade, aims to introduce outstanding rural industrial products and help businesses stabilise production and enlarge consumption markets. On the display at the fair will be handicrafts, farm produce, traditionally processed food, beverages, seedlings, cattle feed, aquatic products and equipment used in agricultural production, processing and preservation. The fair will include conferences and workshops on the rural industry, new products, advanced technologies and export markets. Excellent booths and standout enterprises will be honored at the event as well. The event will also create opportunities for firms in southern localities to exchange experience and grasp customers’ taste to branch out new products and improve competitive capacity.